This hand-crafted chessboard is as much a work of art as a playing surface! 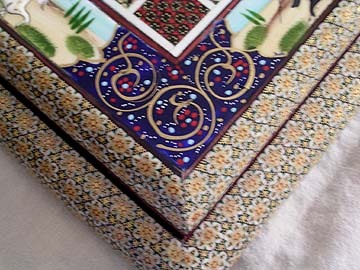 These hand-painted, embossed corners feature a unique mosaic design known as elseemee in Persian along with a bird and floral motif. 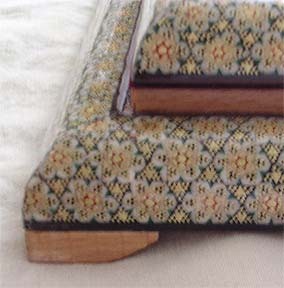 The playing surface lifts up to reveal a "secret compartment." It could be used to store pieces, score sheets, etc. 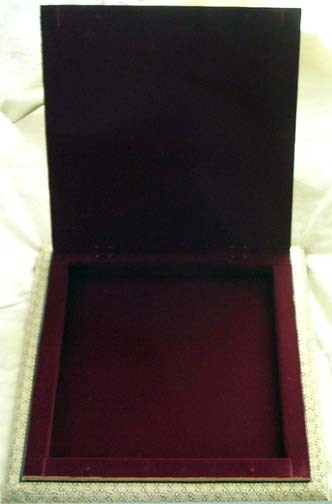 It is fully lined with maroon felt. 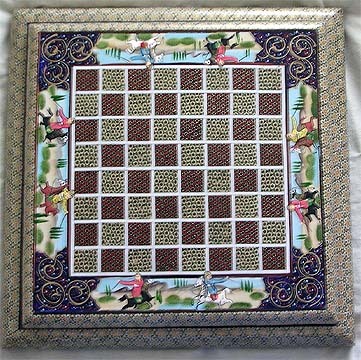 The beauty of this board makes it an attractive object to display in your home - even if you don't play chess. Dimensions: 34.5 cm; approx. 3 cm height. The playing surface is 22 cm. Shipping weight 5.00 pounds.